Well, it’s not so much of a buildup, since the day has actually arrived. In just under nine hours’ time, I will arrive at Tramore Library with my patient husband, groaning under the weight of boxes, of wine and of books. Which is more important is yet to be determined. We will also bring two plates with crackers, cheese cut into cubes and grapes. As you can see, the height of culinary sophistication! You’ll even get little sticks to spear the cheese with and you’ll eat it with pink paper plates. Yes, this launch even has a theme. The lovely Tracy, Head Librarian at Tramore Library, will preside over the vast array of drinks – wine, tea, coffee, water and orange. A veritable rainbow of beverages. And I will be sitting behind another table, with my books displayed in a cage painted pink for the occasion. Underneath the table will be boxes bulging with books, which I fervently hope will not be bulging when the evening’s over. At about six-thirty, the poet Mark Roper will launch the book. Based on previous form, I imagine his words will be understated, but warm and sincere.Then I’ll burble out some thank yous and share out my tale about how I saved my book from the jaws of death. I’ll also read you a choice snippet – I’m warming up my pipes as we speak. The book will be a lovely even tenner, which shouldn’t cause too many headaches, but I have my change float at the ready, thanks to Chris at Apple Brown Betty cafe, supplier of coffee and moral support. And if you buy it, you’ll get my priceless signature. See you all in nine hours. Organising a relaunch for a book is a bit like a second wedding. It’s low key. You’re slightly embarrassed to be asking the same people you asked before and there isn’t the same level of hype and fuss. But it’s also more relaxed and you’re confident that at least you won’t make the same mistakes as last time. That’s how I feel with seven days to go to my second book launch. This time last year, for my first launch, I was riding a roller coaster. I was convinced no one was coming. Then I came home for the launch and was greeted like a celebrity, which naturally did no good for my ego. The night itself was a blur, a wall of sound, an outpouring of people and good wishes. Books were thrust at me and I signed them. I floated into a strange place where though I was thirsty, I had no need of drink. Last year, I was full of illusions. This year, in the surfing spirit of my new hometown of Tramore, I’ll relax and ride the waves. Whether 30 or 70 people turn up, I’ll enjoy the experience just the same. I’ll drink a glass of wine. I’ll move around and mingle and have a laugh. And this year, I’m in charge. I’ve decided what night it will be on and what time. I will make sure that no-one runs out of anything to drink. I may not quite reach the heights of excitement of my first launch, but I’ll savour the experience more. Most of all, I’m looking forward to meeting people in the new community I find myself in and to introducing The Pink Cage to a new audience. I would like to cordially invite you all to my book launch Mark 2, Friday June 29th, Tramore Library, 6pm. Bribing u with free drinks. So here’s what really happened to The Pink Cage. I had two readings coming up and made a casual call to my publishers to order books, thinking I had nothing to do only wait till they had arrived. But they weren’t going to. The voice on the phone told me they’d stopped printing the paperbacks. The book had been out less than a year. Cue a panicked email and some anxious phone calls. Luckily, the publishers agreed to return the rights to me straight away. I didn’t want to let the book die. There were people who hadn’t been able to get hold of it when it came out and new audiences I was encountering through workshops and social media. So I decided to keep the dream alive for a little longer and contact a printer that the publisher recommended. There was still a bit of leg work to be done. I had to commission a new cover because the rights of the cover belonged to the publisher. I was able to commission the same cover designer, Jana Vukovic, who did a fantastic job both times. I also changed the copyright page, the page at the start of a book which tells you who publishes the book and who copyright rests with. I sent the revised PDF and cover off to Gemini Print, who do small print runs of up to 1,000 copies. I had gone for 150 copies and yesterday, those copies arrived. They’re a paper lover’s dream, printed on thick, creamy pages. in print of a generous size. In the meantime, a friend had passed on a link to Booktango, an ebook publishing platform which is letting people publish ebooks for free till July 4th. Because I had everything already in place, it took less than an hour to upload everything and the ebook is now available in the Booktango bookstore. The strength of Booktango is that they send the book to all the major ebook vendors, so it should surface on the likes of Nook, Kobo and iBooks in the coming weeks, as well as Amazon. And those who like their books in dead tree form can just ring or email me and I’ll send one out to you. You have no idea what pleasure it gives me to have such complete control over the distribution. 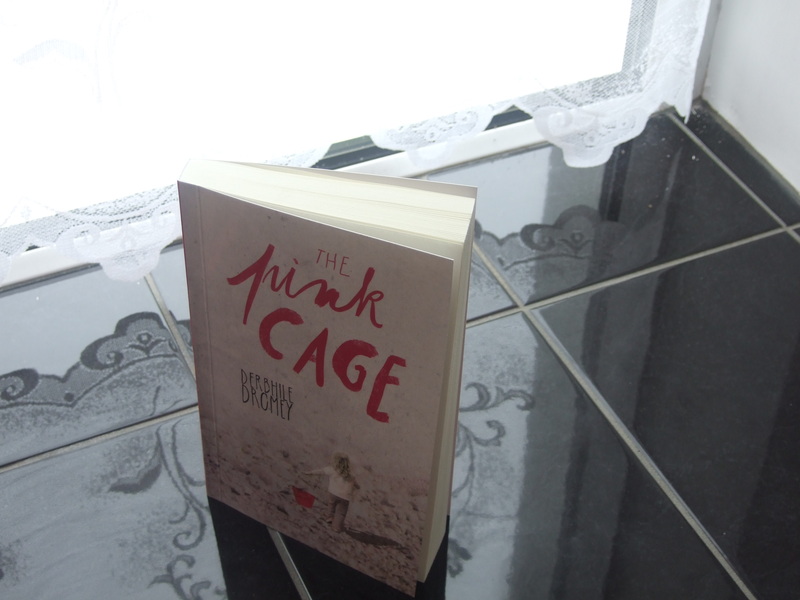 Yesterday, I got my book sample for the brand new edition of The Pink Cage. The books are winging their way to me as we speak. Here’s a sample of what you can expect. Bright, durable cover. Print of a generous size. And oh, that parchmenty paper, with the heady smell of freshly-pressed ink. Yes, I know I have issues.